The Feminine unfolds and blossoms at a tempo unique to the individual who either embraces or grapples with the gifts of Aphrodite. Einar Wegener, a male, 20th-century, Danish artist, whose story is at the core of The Danish Girl, was unique in confronting this Venusian challenge. 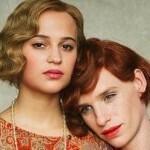 Directed by Tom Hooper, and based on David Ebershoff’s novel about the artist, the movie begins in 1926, as Einar (Eddie Redmayne), a prominent landscape painter, is in the midst of an art show in Copenhagen, receiving hearty accolades for his work. His success has eclipsed the under-the-radar artistic output of his wife Gerda (Alicia Vikander), a portraitist. A handsome and sexually frisky couple, they seem to have it all. Suddenly their life changes. One day Gerda, whose female model (Amber Heard) has cancelled at the last minute, asks her husband if he might serve as a substitute by donning the model’s shoes and dress. We’ve already seen the tactile Einar pleasurably stroke certain pieces of clothing, so his reverently fondling the model’s attire isn’t unexpected. However, this incident seems to trigger in him a treasure chest of previously suppressed emotions tied to the pleasures of behaving like a female. Einar continues to pose for Gerda, she rechristens her husband-muse Lili Elbe, and her new portraits seriously up her credibility as an artist. Gerda and Lili even socialize together, with Lili catching the eye of an admirer (Ben Whishaw). When did you get so pretty, Gerda asks him. “I was always pretty, you just never noticed,” he replies, as he sets about learning how to walk in heels, and wondering whether he is, in fact, pretty enough for the real world. 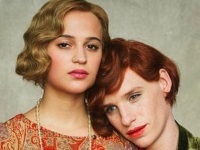 If Einar’s Venusian self-realization seems relatively straightforward and elegant, The Danish Girl succeeds at demonstrating his transformation’s complexity. Venus’ bailiwick includes beauty, relationships and values, and the more committed Einar becomes to living life as an attractive female, the more gut-wrenching it is on the couple, whose connection turns increasingly platonic. “Lili doesn’t exist – we made her up,” says Gerda, and what started off as a fantasy borne of Neptune will soon demand of her tremendous sacrifice, devotion and selflessness. Especially poignant is watching Einar’s self-education at peep shows, as he studies and imitates the Venusian performer’s movements, hand gestures and carriage. When it comes to perfecting one’s Aphrodite, nothing and no place are off-limits to self-fulfillment. Einar’s commitment to altering his gender and his debasement at the hands of the medical profession eventually lead him to a sympathetic and pioneering physician (Sebastian Koch), who performs sexual reassignment surgery, with Einar’s school friend (Matthias Schoenaerts) adding additional support. The surgery, which Einar is told has no guarantees, introduces the Saturn element of physically redefining one’s identity through an irreversible procedure that removes what is no longer needed. Saturn, which rules maturity, involves putting away the things of childhood. In Einar’s case, that one critical thing happened to be his maleness.